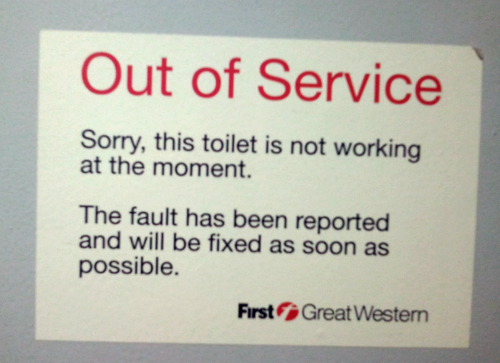 I wonder whether First Great Western read this blog​? Unlikely, I know, but they appear to have improved something that I commented on here. I wrote a while ago about the lack of plain English (and customer awareness) in a particular notice. Last time I travelled by train, I saw a similar notice – but this time better written and without the branding slogans. I wonder, though, why the heading is not ‘Out of order’. ‘Out of Service’ usually refers to trains. This entry was posted in English language, plain English and tagged transport. Bookmark the permalink. ← No fun allowed. Due to health and safety reasons.